The water transport system of woody plants can experience periods of excessive xylem tension. It is generally assumed that during these times, water stored in capacitive tissue moves into the transpiration stream and buffers the liquid tensions that develop inside the vessel lumen, thereby protecting vessel functionality by reducing the risk of gas emboli formation. Since water discharge from stem internal storage compartments is thought to minimize the risk of vessel cavitation, one would expect that water storage compartments involved in the buffering of xylem tensions empty before the onset of vessel cavitation under drought stress, and potentially refill after soil saturation. However, scant in vivo data exist that elucidate this localized spatiotemporal coupling. In woody plants, vessels are embedded in a matrix of xylem tissue composed largely of dead cell types such as libriform fibers and/or fiber-tracheids. In contrast to living cell types that provide for storage of elastic water by cell expansion (e.g. bark and xylem parenchyma), water in dead tissue compartments is stored by capillary forces acting within the narrow lumen of these structures. Knipfer et al. (10.1104/pp.18.01303) now show by means of x-ray computed microtomography of intact saplings of American chestnut (Castanea dentata) that the xylem matrix releases stored water and becomes air-filled either concurrent to or after vessel cavitation under progressive drought stress. Among annual growth rings, the xylem matrix of the current year remained largely water-filled even under severe drought stress. Viability staining highlighted that water release from the xylem matrix was associated primarily with emptying of dead fibers. 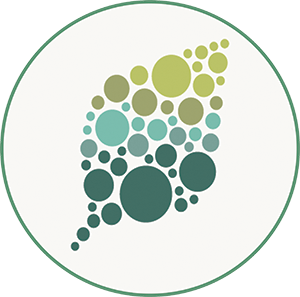 Refilling of the xylem matrix and vessels was detected in intact saplings when the stem water potential was close to 0 MPa, and in leafless saplings over the winter period. 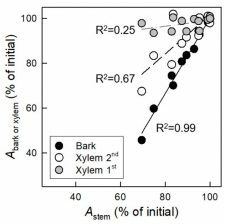 In toto, the results of this study indicate that the bulk of water stored in the xylem matrix is released after the onset of vessel cavitation, and that capillary water contributes to overall stem water storage under drought in this species.